Hey everyone Bob here, also known by Neon. I'm new to the forum, obviously. 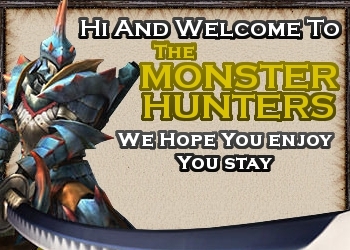 I first started playing Monster Hunter when my best friend showed it to me. My first game was Tri, and I wasted 100+ hours on single player alone. I wanted more out of it, so I moved back in the timeline and tracked down a copy of Freedom Unite, which I've easily wasted 150+ hours on and I still haven't beaten everything. Just recently I downloaded and patched Portable 3rd, so I've been enjoying that game and let me tell you, it's awesome. So as a hunter, I mainly use long swords, but I'm proficient in the use of hammers, lances, and sword & shield. I prefer status weapons over elemental weapons, mainly poison and sometimes paralysis. However, I don't let my preference get in the way of gaining an advantage over a monster whose hide is too thick for my status weapon. I prefer killing over capturing, and my favourite monster to hunt is (right now) probably the Rath wyverns, although I do enjoy a good Barroth/Uragaan hunt. Why on earth do you prefer killing over capture? My favorite monsters are the Barroth and Diablos. I'm the kind of person who gathers items on the way to the monster, and I gather pretty much every chance I get (not while I'm in the same zone as the monster, mind you) so I find that traps and tranqs just get in my way. However, I'll sometimes bring along traps and some bombs and do trap bombing, but only rarely. On another note, I like the satisfying feel of carving up a monster after a good hunt. And THAT my good sir is why I prefer killing over capping. As I said before though, I don't let preference get in the way when I can gain an advantage, so if I need a specific item that is easier to get trapping, I'll definitely go for it. Hey thanks I do have a question. What do the Rathalos Rubies on this forum represent? Aaaaand the athalos Rubies are more like a skill points system here, you get more Rathalos Rubies as you post and stuff. Welcome to the forum, I hope you have a lovely stay here. I'm a lancer by trade. Lookign forward to seeing your posts and hearing your ideas.